Now here's a confession. 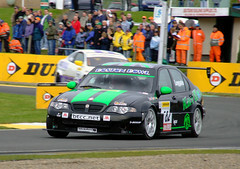 I'd usually think of myself as a racing purist, but I really like the British Touring Car Championship. I know, I know. They use reverse grids, success ballast, rules that are arbitrarily tweaked to ensure parity between the manufacturers, and the back half of the grid is full of wealthy amateurs who really should have no place in a serious racing series. But still, I like it. The racing is usually pretty close and there are a serious number of potential race winners in the field. 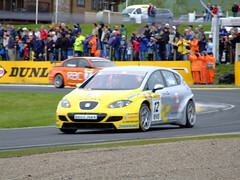 There are the full works teams of SEAT and Vauxhall who will always tend to win out over the course of a whole season thanks to their considerably greater resources. Behind them, though, are a good number of semi-works and private efforts that can win races. West Surrey Racing have been in the business seemingly forever. They ran Ayrton Senna in Formula 3 back in the early 1980s, and these days they run a very effective customer BMW touring car team. Lead driver, Colin Turkington has won on a number of occasions with their s2000 3 series, and even young ride-buyer Tom Onslow Cole has emerged on top on one occasion. 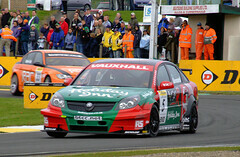 Team Dynamics were the only private team to win BTCC races in the Super Tourer days when manufacturers were spending serious money on the series. These days, they continue to impress as the only private team to have built their own race-winning s2000 car from scratch. Their Honda Civic Type-Rs might look decidedly odd, but they haven't half proved effective. Both Matt Neal and Gordon Shedden have won with them this year, even if they have not been able to repeat the level of dominance they achieved with their loophole-exploiting BTC-spec Honda Integras over the previous two seasons. The series uses enough standard parts, and has enough restrictions in place on testing and development, that a couple of very small operations have proven quite successful at this level too. 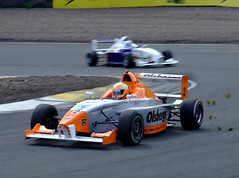 Mike Jordan, the late-fortysomething former GT racer, has run consistently towards the front of the field in a two year old ex-Team Dynamics Integra. SEAT Cupra champion Mat Jackson has won with a family-run ex Andy Priaulx BMW (in marked contrast to the complete lack of success enjoyed by Martyn Bell in another ex-Priaulx BMW, thus showing the importance of the driver at this level). Former Clio-cup front runner Adam Jones has also run near the front on occasion in an old SEAT Toledo run by WTCC privateer frontrunners GR-Asia. That's, by my count, about 10 potentially race winning cars. Really not a bad score by any count, and more than most series can boast. I suspect that only the WTCC and NASCAR do better on that score, and the WTCC only because they have a very silly weight penalty system in place and NASCAR because the caution-period rules leave that series a virtual lottery. So it was with some enthusiasm that I jumped on an early morning bus to get to my local circuit, the 1.3m Knockhill track, to see the series 'in the flesh' for the first time in several years. For those of you not familiar with the eccentric Fife venue, Knockhill is a very short circuit, and even a BTCC car can lap it in around 53s but it is not without its challenges. The blind downhill switchback of Duffus Dip is one, while the 3rd gear slightly off-camber Clark (I refuse to call it Carlube Corner) can also catch out the unwary. Even the equally appallingly named Real Radio Hairpin presents its own difficulties. With the longest braking zone on the circuit, it presents the best passing opportunity the circuit has to offer, but with its steeply uphill exit, the correct line is far from obvious, and many drivers tried various different approaches over the weekend. As it turned out, the three BTCC races were not absolute classics, and I usually seemed to end up stood in the wrong place to see the action. Knockhill is not the easiest place in the world to overtake (ranking alongside the Brands Indy circuit in this regard) but the racing was certainly close. 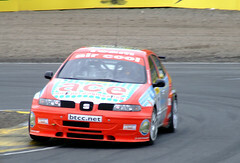 Darren Turner took victory in the first two races, though Gordon Shedden looked threatening in race one until coming off the worse in a move at Real Radio which put him out of the race. The third race was a touch more hard fought at the front, with Honda drivers Jordan, Neal and Shedden shuffling the lead between them before the local boy took advantage of his circuit knowledge (he's a race instructor at Knockhill by day) to pull out in front. Down the field, there seemed to be almost nothing to split the SEATs (including privateer Jones), the Vauxhalls, the WSR and Jackson-MSport BMWs and Jordan's Honda. In short, the rule makers appear to have done a very good job of equalising the front wheel drive and rear wheel drive cars, the private BTTC-spec cars and the works s2000 cars. As it turned out, one of the most hard fought battles of all was for the honour of not finishing last, with series-newcomer Alan Taylor and perennial backmarkers Martyn Bell and Fiona Leggate having their own private scrap down the field. Only the other Kartland MG driver, Jason Hughes, appeared to left entirely on his own with nobody to play with. In the circumstances, it was a shame that Chris Stockton's rather pretty Lexus (give or take a couple of Daily Sport logos, anyway) had blown an engine on Saturday and taken no part in the day's races. So what makes this series work from a spectator's point of view? Firstly, I think, the relative simplicity of the cars provides something of a level playing field between the well organised privateers and the works cars. Secondly, costs have been kept down enough to allow a reasonably sized field to be put together (in stark contrast with the dying years of the Super Tourer formula). Thirdly, the fact that the series now runs to the same rules as the WTCC means that there are plenty of second hand S2000 spec cars around for those willing to try their luck (hence the massed ranks of Seat Toledos and Alfa 156s, although these were largely missing at Knockhill). The other thing that the series gets right is that it realises that it exists mainly for the benefit of the fans. There are few other series where it is so easy to wander through the paddock and look in on the teams as they prepare and repair the cars. The three-race format gives the spectator plenty of value for money and the drivers are much more willing to interact with the spectators than in most other series of any note. Downsides? They still haven't sorted out the support package. 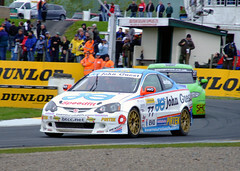 One make racing remains as dull and monotone as it ever was, and the BTCC support races are all one make races. At Knockhill, this was made the worse by a very sparse Porsche Carrera field and the absence of the at least reasonably quick Formula Renaults. There was one unexpected upside, though. As a keen observer of young talent coming up through the ranks, I really do think we're going to be hearing a lot more of double FBMW-winner, Marcus Ericsson in the years to come.